It is only when we begin to forget and let go of life’s conditioning that we can start to truly begin to understand our ‘Self’. It isn’t easy to look in the mirror and whisper nice words to the reflection that stares back at us. How much can you honestly say to yourself that who you see in the mirror is someone you love? Saying ‘I love you’ to ourself, well the words might come out clearly, but what is your Ego telling you? Unless those beautiful words are spoken with conviction and truth there is no substance to them, they may as well be meaningless. 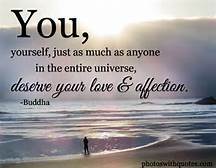 The purpose of our existence is to connect to that place deep within ourself so we are honestly able to love who we are, love where we are and with love, accept all of our flaws and faults. There is no such thing as perfection and yet we humans constantly and relentlessly endeavour to be perfect in everything we do. Constant pressures we inflict on ourselves, faultless, flawless attempts to bring superb optimum results to our everyday life. There is no wonder at times we feel completely and utterly exhausted. A powerful amount of our energy is used to withhold the most perfect example of who we are and keep it reflecting out into the world. Why is it so important for us to feel the need to improve ourselves each and everyday? Understanding the value of improvement perhaps needs to be broken down. The power of our own influence is by far the most significant. How we react to our outside world which is what we know as the daily grind of life, is necessary in terms of survival on many different levels. What is going on in the spirit of who we are, is where we pay little or no attention. At some point in your life you will be forced to stop, whether this action comes as a break up, a loss of some sort, a health issue, or just a slap in the face to wake you up to the reality of your unhappiness, one thing is for sure you can be guaranteed that this day will come. Then the choice is yours, to see this dreaded day as a gift or a curse. This particular day will be so meaningful, so much so it may be difficult to comprehend in the immediate. It is what comes to light later, inside of you that will matter the most. Regardless of what the circumstance of events are, this life changing day will represent the beginnings of your journey back to your ‘Self’. It will be an opportunity given to you by your Soul to take a better look at how you take care of you. You will be asked to do a review, how much love do you emanate back to yourself! Loving who we are wholly and unconditionally takes patience, courage and faith. The journey may be long and strenuous, but the rewards that come with letting go of the need to be perfect and embracing the freedom to just ‘be’, will be worth all of your sweat, and every single tear drop.